Minimally Invasive Transverse Aortic Constriction in Mice Aung Moe Zaw1, Connor M. Williams2, Helen K. W. Law3, Billy Kwok Chong Chow1 1School of Biological Sciences, The University of Hong Kong, 2College of Arts and Science, New York University, 3Department of Health Technology and Informatics, Faculty of Health and Social Sciences, The Hong Kong Polytechnic University Minimally invasive transverse aortic constriction (MTAC) conserves the essentials of regular transverse aortic constriction (TAC) while eliminating the use of a ventilator with tracheal intubation. It proves to be a highly desirable method for high-throughput studies on left ventricular overload, particularly in translational studies. 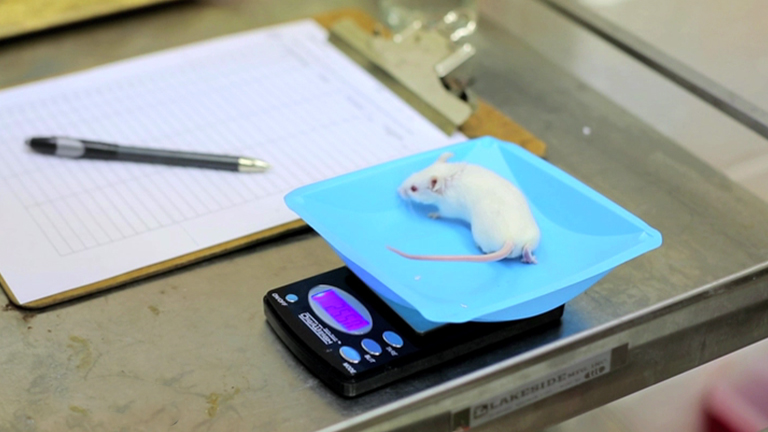 Using the Activity-based Anorexia Rodent Model to Study the Neurobiological Basis of Anorexia Nervosa Tara Gunkali Chowdhury1, Yi-Wen Chen1, Chiye Aoki1 1Center for Neural Science, New York University Here we present a protocol to induce activity-based anorexia (ABA) in female adolescent mice. ABA is a condition of hyperactivity evoked by imposing food restriction on rodents with access to a running wheel. This phenomenon is being used as a model to study the underlying neurobiology of anorexia nervosa. Coordinate Mapping of Hyolaryngeal Mechanics in Swallowing Thomas Z. Thompson1, Farres Obeidin1, Alisa A. Davidoff2, Cody L. Hightower1, Christohper Z. Johnson1, Sonya L. Rice1, Rebecca-Lyn Sokolove1, Brandon K. Taylor1, John M. Tuck1, William G. Pearson, Jr.3,4 1Medical College of Georgia, Georgia Regents University, 2Department of Communicative Sciences and Disorders, New York University, 3Department of Cellular Biology & Anatomy, Georgia Regents University, 4Department of Otolaryngology, Georgia Regents University Coordinate mapping is a method of documenting salient features of hyolaryngeal biomechanics in the pharyngeal phase of swallowing. This methodology uses image analysis software to record coordinates of anatomical landmarks. These coordinates are imported into an excel macro and translated into kinematic variables of interest useful in dysphagia research. The Use of Chemostats in Microbial Systems Biology Naomi Ziv1, Nathan J. Brandt1, David Gresham1 1Center for Genomics and Systems Biology, Department of Biology, New York University Cell growth rate is a regulated process and a primary determinant of cell physiology. Continuous culturing using chemostats enables extrinsic control of cell growth rate by nutrient limitation facilitating the study of molecular networks that control cell growth and how those networks evolve to optimize cell growth. A Simple Protocol for Platelet-mediated Clumping of Plasmodium falciparum-infected Erythrocytes in a Resource Poor Setting Dumizulu L. Tembo1, Jacqui Montgomery1, Alister G. Craig2, Samuel C. Wassmer3 1Malawi-Liverpool-Wellcome Trust Clinical Research Programme, 2Liverpool School of Tropical Medicine, 3Department of Microbiology, Division of Medical Parasitology, New York University School of Medicine This method investigates the platelet-mediated clumping phenotype of Plasmodium falciparum-infected erythrocytes (pRBC) in clinical isolates. This is performed by isolating and co-incubating platelet-rich plasma and a suspension of pRBC. Combined Immunofluorescence and DNA FISH on 3D-preserved Interphase Nuclei to Study Changes in 3D Nuclear Organization Julie Chaumeil1, Mariann Micsinai1,2,3,4, Jane A. Skok1 1Department of Pathology, New York University School of Medicine, 2New York University Center for Health Informatics and Bioinformatics, 3NYU Cancer Institute, 4Department of Pathology and Yale Cancer Center, Yale University School of Medicine Here we describe a protocol for simultaneous detection of histone modifications by immunofluorescence and DNA sequences by DNA FISH followed by 3D microscopy and analyses (3D immuno-DNA FISH). Right Ventricular Systolic Pressure Measurements in Combination with Harvest of Lung and Immune Tissue Samples in Mice Wen-Chi Chen*1, Sung-Hyun Park*1, Carol Hoffman1, Cecil Philip1, Linda Robinson2, James West2, Gabriele Grunig1,3 1Department of Environmental Medicine, New York University School of Medicine, Tuxedo, 2Division of Allergy, Pulmonary, & Critical Care Medicine, Department of Medicine, Vanderbilt University Medical Center, 3Division of Pulmonary Medicine, New York University School of Medicine A specific and rapid protocol to simultaneously investigate right heart function, lung inflammation, and the immune response is described as a learning tool. Video and figures describe physiology and microdissection techniques in an organized team-approach that is adaptable to be used for small to large sized studies. Dissection and Immunohistochemistry of Larval, Pupal and Adult Drosophila Retinas Hui-Yi Hsiao*1, Robert J. Johnston Jr.*1, David Jukam*1, Daniel Vasiliauskas*1, Claude Desplan1, Jens Rister1 1Department of Biology, New York University The Drosophila retina is a crystal-like lattice composed of a small number of cell types that are generated in a stereotyped manner 1. Its amenability to sophisticated genetic analysis allows the study of complex developmental programs. This protocol describes dissections and immunohistochemistry of retinas at three discrete developmental stages, with a focus on photoreceptor differentiation. Measuring the Subjective Value of Risky and Ambiguous Options using Experimental Economics and Functional MRI Methods Ifat Levy1,2, Lior Rosenberg Belmaker1, Kirk Manson1, Agnieszka Tymula3, Paul W. Glimcher3,4,5 1Section of Comparative Medicine, Yale School of Medicine, 2Department of Neurobiology, Yale School of Medicine, 3Center for Neural Science, New York University, 4Department of Psychology, New York University, 5Department of Economics, New York University Using functional MRI and behavioral methods to determine the neural representation of the subjective value of risky and ambiguous options in the human brain. Extinction Training During the Reconsolidation Window Prevents Recovery of Fear Daniela Schiller1, Candace M. Raio2, Elizabeth A. Phelps3 1Departments of Psychiatry and Neuroscience, and Friedman Brain Institute, Mt. Sinai School of Medicine, 2Department of Psychology, New York University, 3Department of Psychology and Center for Neural Science, New York University Conditioned fear can be diminished through an inhibitory process called extinction, but can resurface under conditions such as the passage of time or exposure to stress. Our protocol presents a novel way of preventing fear recovery by introducing extinction during the reconsolidation window (the re-storage phase of a reactivated memory). Isolation and Culture of Human Fungiform Taste Papillae Cells Hakan Ozdener1, Andrew I. Spielman2, Nancy E. Rawson3 1Monell Chemical Senses Center, 2New York University College of Dentistry, 3AFB International We aimed to develop a reproducible protocol for isolating and maintaining long-term cultures of human fungiform taste papillae cells. Cells from human fungiform papillae obtained by biopsy were successfully maintained in culture for more than eight passages (12 months) without loss of viability. A Primary Neuron Culture System for the Study of Herpes Simplex Virus Latency and Reactivation Mariko Kobayashi1, Ju-Youn Kim1, Vladimir Camarena2, Pamela C. Roehm3, Moses V. Chao2,4,5,6,7, Angus C. Wilson1, Ian Mohr1 1Department of Microbiology, New York University School of Medicine, 2Molecular Neurobiology Program, Skirball Institute for Biomolecular Medicine, New York University School of Medicine, 3Department of Otolaryngology, New York University School of Medicine, 4Department of Cell Biology, New York University School of Medicine, 5Department of Physiology and Neuroscience, New York University School of Medicine, 6Department of Psychiatry, New York University School of Medicine, 7Center for Neural Science, New York University School of Medicine The protocol describes an efficient and reproducible model system to study herpes simplex virus type 1 (HSV-1) latency and reactivation. The assay employs homogenous sympathetic neuron cultures and allows for the molecular dissection of virus-neuron interactions using a variety of tools including RNA interference and expression of recombinant proteins. Modified Yeast-Two-Hybrid System to Identify Proteins Interacting with the Growth Factor Progranulin Qing-Yun Tian1, Yun-Peng Zhao1, Chuan-ju Liu1,2 1Department of Orthopaedic Surgery, NYU Hospital for Joint Diseases, 2Department of Cell Biology, New York University School of Medicine We have modified the conventional yeast two-hybrid screening, an effective genetic tool in identifying protein interaction. This modification markedly shortens the process, reduces the workload, and most importantly, reduces the number of false positives. In addition, this approach is reproducible and reliable. How to Create and Use Binocular Rivalry David Carmel1,2, Michael Arcaro3,4, Sabine Kastner3,4, Uri Hasson3,4 1Department of Psychology, New York University, 2Centre for Neural Science, New York University, 3Department of Psychology, Princeton University, 4Neuroscience Institute, Princeton University Binocular rivalry occurs when the eyes are presented with different images at the same location: one image dominates while the other is suppressed, and dominance alternates periodically. Rivalry is useful for investigating perceptual selection and visual awareness. Here we describe several easy methods for creating and using binocular rivalry stimuli. Assessment of Immunologically Relevant Dynamic Tertiary Structural Features of the HIV-1 V3 Loop Crown R2 Sequence by ab initio Folding David Almond1, Timothy Cardozo1 1Department of Pharmacology, School of Medicine, New York University The crown region of different V3 loop sequences of the surface envelope glycoprotein (gp120) of HIV-1 can be structurally characterized in many cases by in silico folding of positions 10 to 22 of the loop using a state-of-the-art ab initio folding algorithm. Here we demonstrate the folding and evaluation of this region of the V3 loop from the R2 strain of HIV-1, a uniquely neutralization sensitive strain with puzzling functional properties. SDS-PAGE/Immunoblot Detection of Aβ Multimers in Human Cortical Tissue Homogenates using Antigen-Epitope Retrieval Rebecca F. Rosen1, Yasushi Tomidokoro2, Jorge A. Ghiso3, Lary C. Walker1,4 1Yerkes National Primate Research Center, Emory University, 2Department of Neurology, Institute of Clinical Medicine, Tsukuba University, 3Department of Pathology, New York University School of Medicine, 4Department of Neurology, Emory University We describe a technique for the preparation of clarified human cortical homogenates, protein separation by SDS-PAGE, antigen retrieval and immunoblotting with an antibody to the Aβ peptide. Using this protocol, we consistently detect monomeric and multimeric Aβ in cortical tissue from humans with Alzheimer's pathology. Fluorescence Activated Cell Sorting of Plant Protoplasts Bastiaan O. R. Bargmann1, Kenneth D. Birnbaum1 1Center for Genomics and Systems Biology, Department of Biology, New York University A method for isolating specific cell types from plant material is demonstrated. This technique employs transgenic marker lines expressing fluorescent proteins in particular cell types, cellular dissociation and Fluorescence Activated Cell Sorting. Additionally, a growth setup is established here that facilitates treatment of Arabidopsis thaliana seedlings prior to cell sorting. Supported Planar Bilayers for the Formation of Study of Immunological Synapses and Kinapse Santosha Vardhana1, Michael Dustin1 1Helen and Martin S. Kimmel Center for Biology and Medicine at the Skirball Institute of Biomolecular, New York University - NYU Supported planar bilayers are powerful tools that can be used to model the molecular interactions in an immunological synapse. Here, we show methods for anchoring cell adhesion proteins known to modulate synapse formation to the upper leaflet of the lipid bilyer and visualize synapse formation using TIRF microscopy.